Does Australia still spray incoming aircrafts with insecticide? 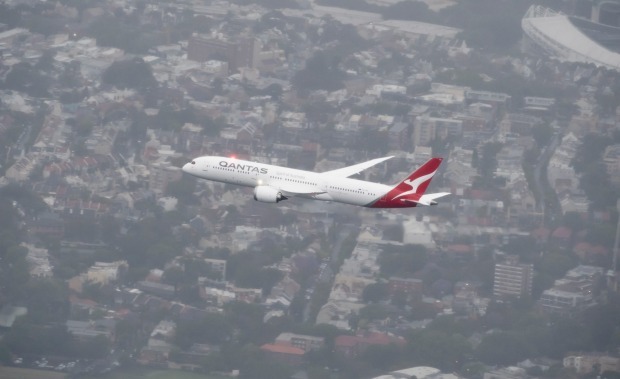 Photos: On board the Qantas Dreamliner. 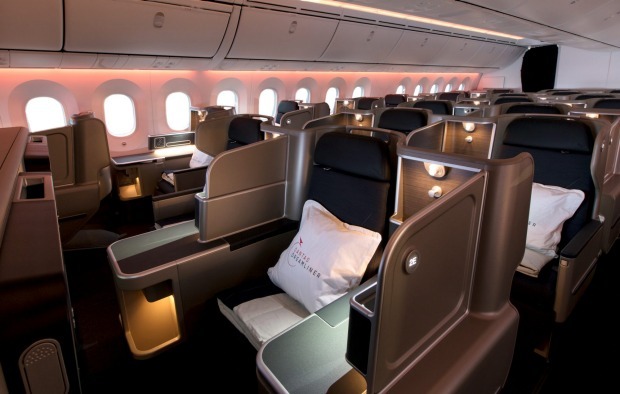 The Qantas 787 Dreamliner business class cabin. 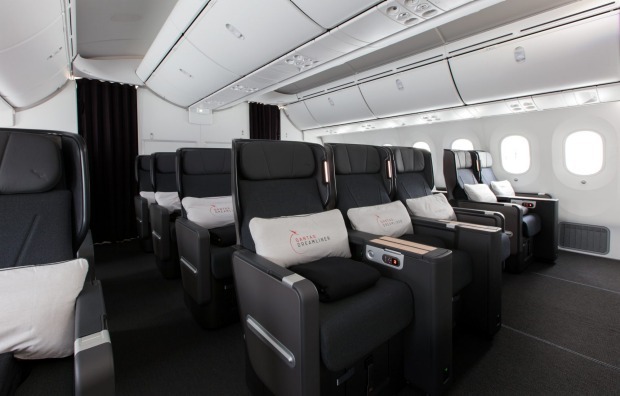 The Qantas Dreamliner 787 business class cabin. The new premium economy class. 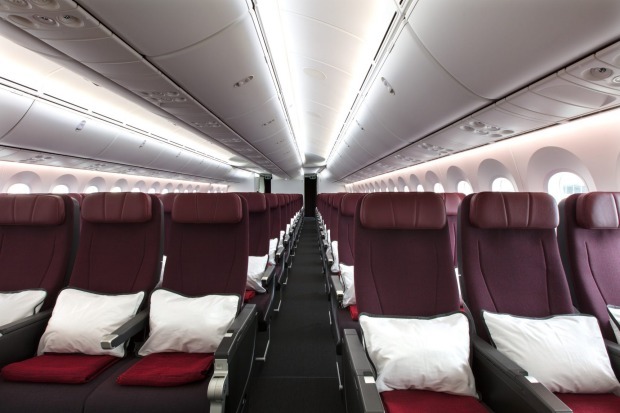 The Qantas Dreamliner features a new premium economy seat larger than its previous version seen on the Airbus A380. Economy class seats offer a little more legroom than the A380. There are 166 economy class seats on board. 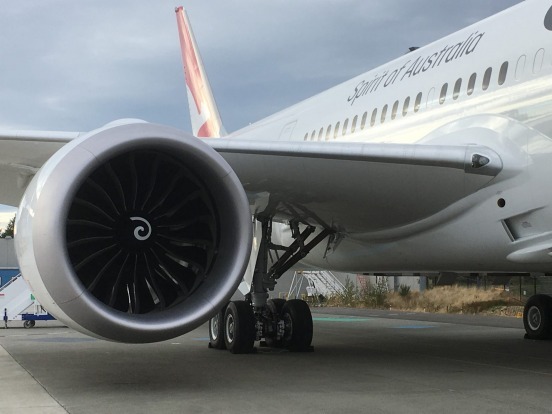 The freshly delivered Qantas Boeing 787-9 Dreamliner is being called a "game changer" by the airline. And it's true, the cutting-edge plane is part of the next generation of aircraft and will open up new frontiers in travel. 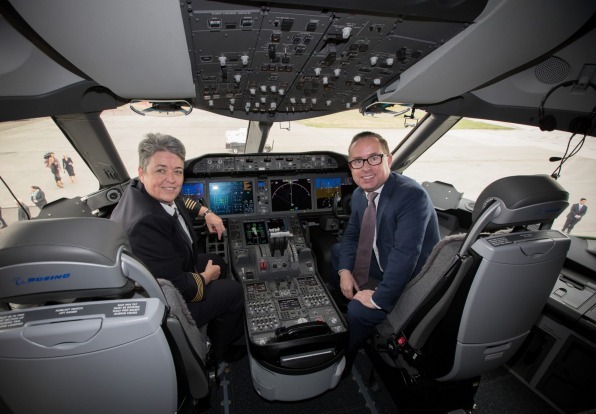 One of those new frontiers is non-stop flights between Australia and Europe, indeed the "last frontier" of air travel, according to Qantas CEO Alan Joyce. Joyce's "Project Sunrise" calls on the two major aircraft manufacturers, Boeing and Airbus, to create an aircraft that can fly non-stop between Australia's east coast and London, New York, and possibly Cape Town or Rio de Janeiro. This aircraft, if it happens, is unlikely to be a Dreamliner, which currently falls short of the range necessary. However, the next Boeing 777 comes close, and Boeing believes it can modify the aircraft to make the distances Joyce has called for. In the meantime, the dream of non-stop flights to London from Australia will soon become a reality, provided you fly from Perth. 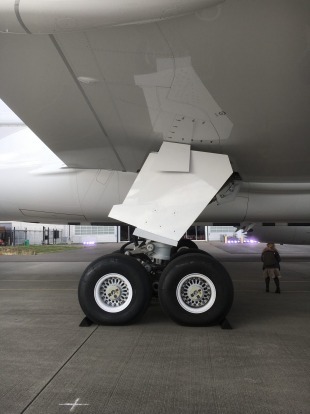 The 787-9 Dreamliner will take off on the first flight in March next year. 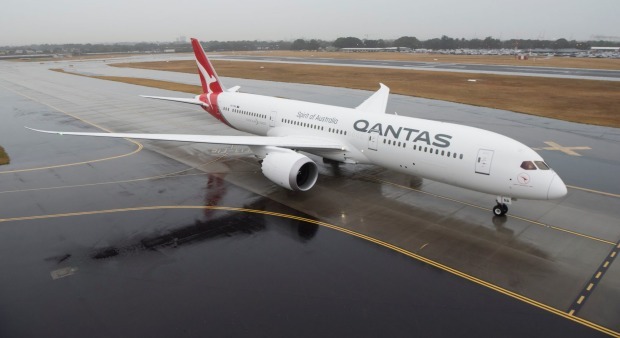 Passengers flying with Qantas from Melbourne to London will also fly via Perth on the Dreamliner, while Sydney flights on older aircraft go through Singapore. The non-stop leg from Perth to London will take about 17 hours – an extremely long time to spend cooped up on an aircraft. 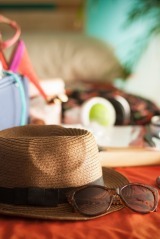 So what can passengers expect? 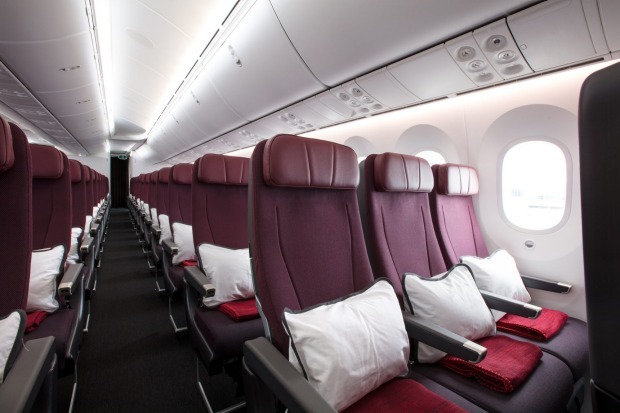 Here's the lowdown on what flying on board the Qantas Dreamliner is like, class by class. 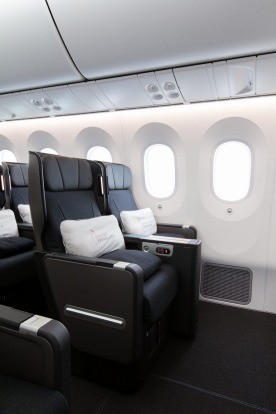 There are several aspects of the Dreamliner that all passengers can enjoy the benefits of, regardless of class. 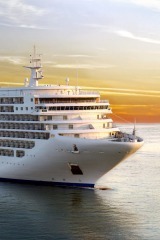 The first thing passengers will notice are the high ceilings and the large windows. Boeing likes to say these large windows mean "everyone gets a window seat", and it's true that it is easier to see out of the window, even if you're not in a window seat. Dimmer switches, rather than shades, mean you can still see out of the window without having to blind the other passengers trying to watch their entertainment screens. The other much-vaunted aspect of the Dreamliner is the cabin air. 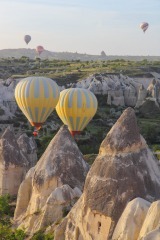 The pressure is higher – closer to the experience of being on the ground – and the air is more humid. 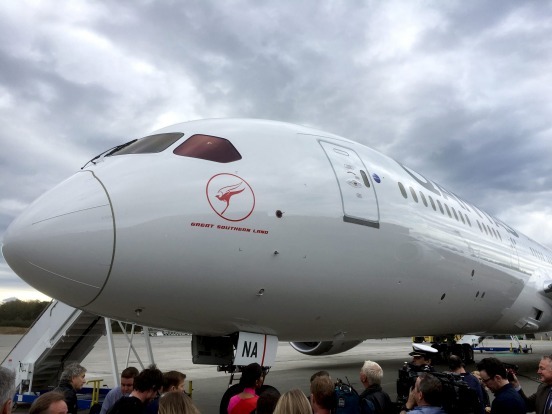 Boeing says this will reduce the effects of jet lag and, from my own experience on board the Qantas 787 along with several other Dreamliners, while I still felt tired after an overnight flight, I did not have the headache and sore eyes that I typically experience on other aircraft. 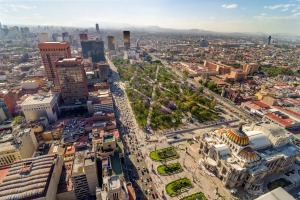 For these new long-haul flights, Qantas has worked with the University of Sydney's medical research institute the Charles Perkins Centre to help develop further strategies on reducing jet lag. This includes the style of lighting used at different points during the flight along with working out the ideal timings of the meal service. 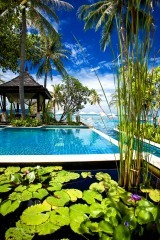 If you're going to spend 17 hours on a plane, this is the place to do it. 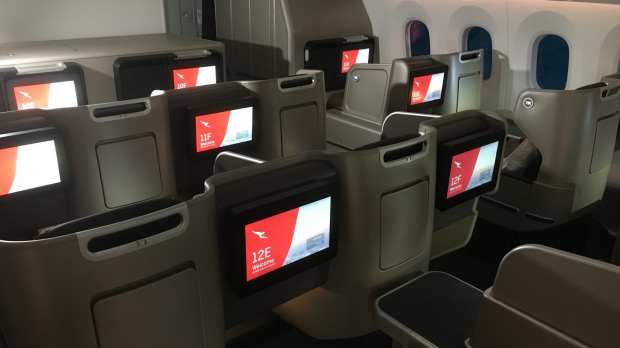 The business class seats on board the 787 are the same as those introduced on the Qantas Airbus A330s over the past three years. 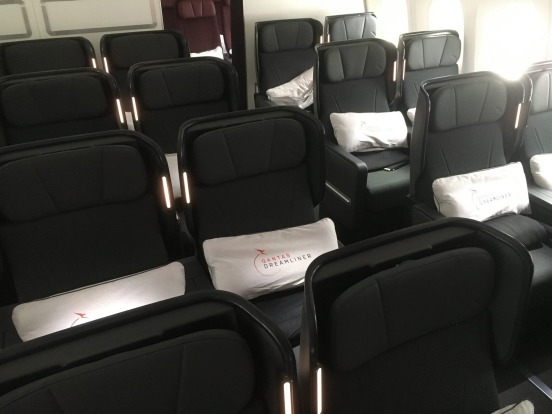 The big advantage of these "business suites" (as Qantas calls them) is they offer direct aisle access to all business class passengers, thanks to the 1-2-1 cabin layout. There's no squeezing past your neighbour if you're in the window seat, unlike on board the A380 or 747. 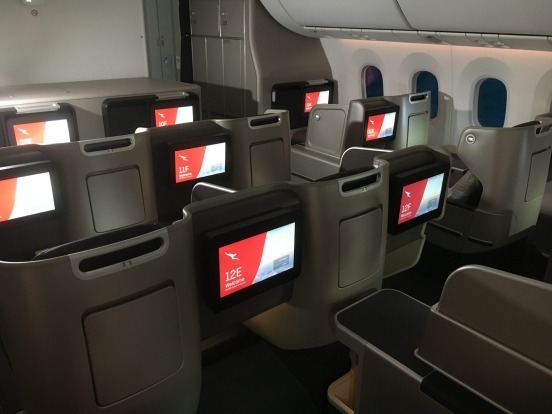 All the features you expect from a top-tier business class seat are here – the seat converts to a long, lie-flat bed; the entertainment touch-screen is large, crisp and responsive; noise-cancelling earphones are provided; there is power for your own devices. The tray table slides out from the side, rather than having to be folded away, which makes it very easy to move in and out if you need to get up in a hurry or access other parts of the seat. There is excellent storage space available, with a pocket for documents along with a shelf above the armrest and a cubby by your feet that's large enough to hold a small carry-on. There are two personal lights – the typical reading light, along with a light from below that's a more ambient, less disturbing option in the dark. 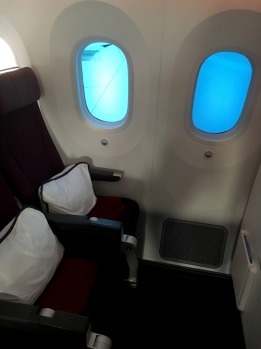 The seats have an interlocking design, so some passengers in windows seats are closer to the window than others. Those looking to feel truly cocooned in their own space should opt for an odd-numbered seat on the window (apart from the last three rows of business, where the even numbers are in this position). 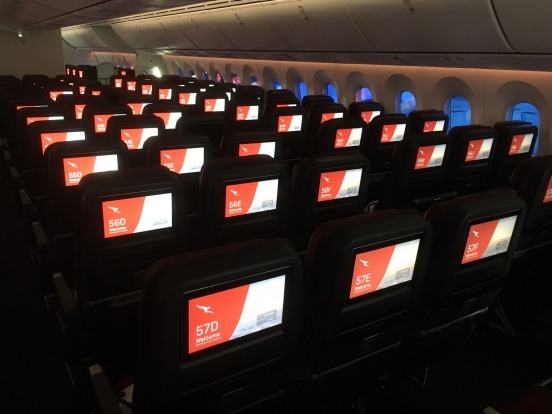 Qantas has introduced an all-new premium economy seat for the 787 and increased the number of seats available for this popular class. There are 28 seats in a 2-3-2 layout, so there remains a dreaded middle seat. 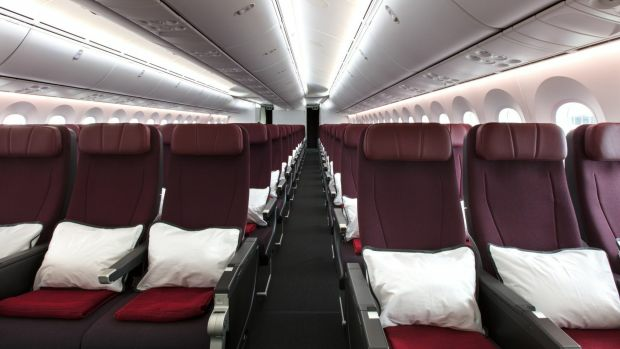 Seat pitch is the same as the A380 premium economy (38 inches) but the seats have been widened by one inch. The footrest is activated by pulling a small lever. It's a bit tricky to work out, but essentially you need to use the footrest regardless of height, otherwise you may find it against your knees or shins if the seat in front is reclined and you're slumped in your seat. There is a seat pocket and an additional storage area in the seat back that locks away nicely, giving you easy access to your small items. The tray table is located in the armrest. The extra-wide pillow has a cover that fits over the headrest to hold it in place. With the headrests adjustable wings it makes for a very supportive and comfortable headspace. The entertainment screen is large – slightly bigger than a standard tablet screen – and also features a small ledge which pops out and can but used to hold your own device if you prefer to watch something on that. Larger passengers will be keen on getting an aisle seat – a small button lets you push the outer armrest down to become level with the pan of the seat, adding significant extra width. 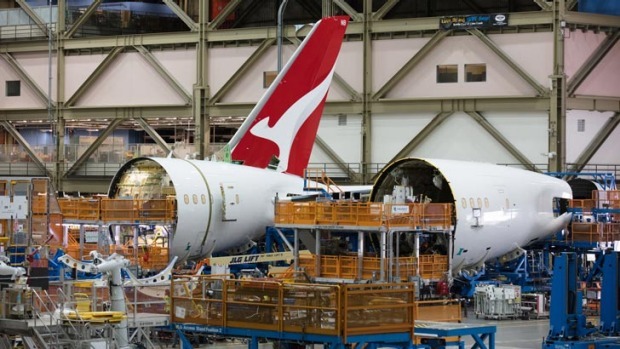 While Qantas has spruiked that its Dreamliner is more spacious than most 787-9, with only 236 seats on board an aircraft that typically carries more than 300, this is not because the economy seats are any bigger. 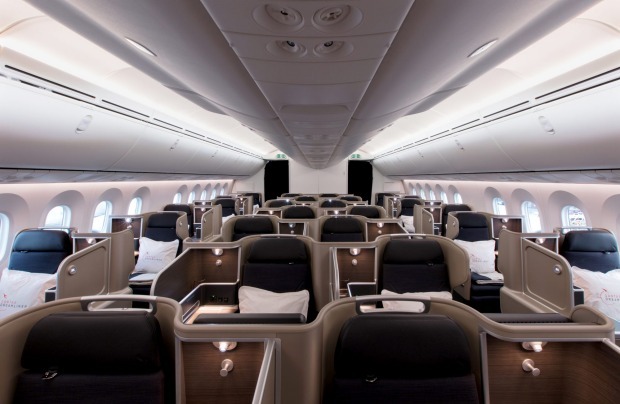 Rather, it's because this plane features a larger percentage of business and premium seats than most airlines carry (about half the plane is taken up by the business and premium). In fact, the economy class seat is actually marginally narrower (0.76 cm) than that found on board the airline's A380s and 747s. 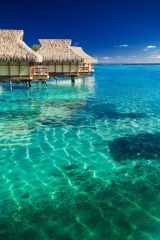 That said, there's plenty of good news for the economy class seat too. There's an extra inch (2.54 cm) of legroom compared to the other international Qantas aircraft and, while an inch doesn't sound like much, it can make a significant difference to taller passengers. The legroom feels good, even when the seat in front is fully reclined. The footrest is a flexible net that cradles your feet. The headrest has adjustable sides and, like in premium economy, the pillow slip goes over the headrest, keeping it in place throughout the flight. 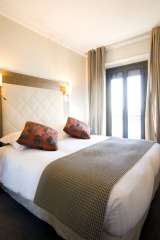 The pillow and blanket both feel thick and comfortable. The entertainment screen is a good size, sharp and responsive to touch like a tablet. Qantas has added a dropdown shelf to support your own device if you prefer, meaning you won't have to hold your phone or tablet, or lie it on the tray table. There is power as well as a USB port. The tray table folds in half, so it's high on the seat back when retracted, keeping it away from your legs. There's also a small storage space just large enough to keep a bottle of water in – this is a nice innovation since wedging a bottle into the seat pocket typically forces it forward, reducing legroom. Overall, this is an innovative economy class seat, though the width may be an issue for larger passengers. Flying for 17 hours on the upcoming Perth to London route will be an endurance test for any passenger, but many Australians already fly 15 hours returning from Los Angeles and close to 17 hours on flights from Dallas to Sydney. In the excellent business class suite the London flight will be a doddle, with plenty of time to sleep, work and watch a few movies. 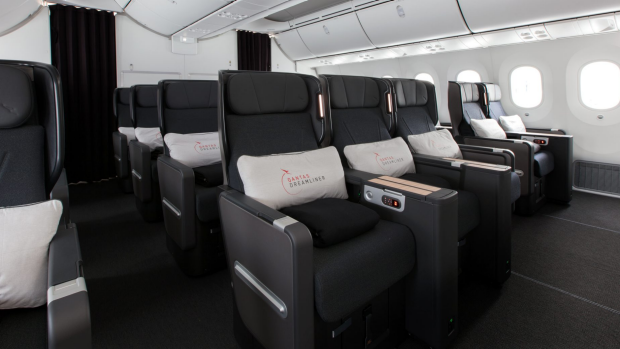 Premium economy and economy passengers will find it tougher, but the benefits the Dreamliner brings to the flight experience, particularly the cabin air, should make this more pleasant than most long-haul flights. See also: Airbus A350 vs the Dreamliner: Which new plane is best on a long haul?